In early December 2015 I travelled from Sydney to the Judith Wright Centre in Fortitude Valley in Brisbane to attend a gathering, the likes of which had not been seen since 2005. I was on my way to the Dana Waranara convergence of Aboriginal and Torres Strait Islander dance, a national summit organised by BlackDance in partnership with Performing Lines Australia. Previous such meetings, like the National Indigenous Dance Forum in 2005, the dance forums at the Cairns Indigenous Arts Festival and Darung Muru, the NSW Aboriginal Dance Forum in 2011, sought to bring together a largely independent dance sector to share knowledge of practice, build connections and identify strengths, challenges and opportunities across the first peoples dance sector. Dana Waranara achieved all of this, but also served another very special purpose by gathering a cohort of national and international presenters and dance practitioners from New Zealand, Canada and North America to discuss the challenges and opportunities for touring Indigenous dance in Australia and overseas. As I work primarily in theatre, my interest in attending Dana Waranara was to listen to and record these conversations, to understand more about touring Indigenous work and to develop a greater appreciation of the role of dance as cultural practice. BlakDance is Australia’s peak body for Indigenous dance. Located in Brisbane, the organisation is governed by an Indigenous Board and managed by Executive Producer Merindah Donnelly and General Manager Jane Fuller. Neither works for BlakDance full time, nor do they live in Brisbane permanently. This is an agency with no stable base and run from company laptops. Jane works part-time from her home on the NSW Far North Coast and Merindah produces from anywhere in Australia or the world at any time. Both manage BlakDance very well in this way, although I am sure it has its challenges. To my knowledge BlakDance is the only Indigenous peak arts body of its kind in Australia. Providing compelling arguments to fully fund such companies in Australia’s current arts funding environment has become increasingly difficult as many non-indigenous companies can and do support Indigenous work. Although it may also be the case that non-indigenous agencies also struggle financially there does seem to be less funding provided to the Indigenous performing arts sector overall. Co-producing has become an economic necessity for many organisations and for Dana Waranara BlakDance partnered with Performing Lines, Australia’s leading performing arts producer and touring agency. 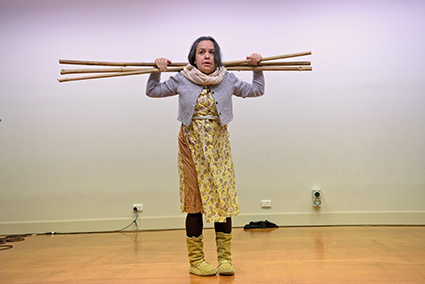 Performing Lines currently manages BlakLines, a national performing arts touring initiative that develops opportunities for presenters and audiences to connect with contemporary Aboriginal and Torres Strait Islander performing artists in dance and theatre. This is a particularly well-suited partnership for both organisations with their similar aims to further opportunities for the Indigenous performing arts sectors. The first morning of the Dana Waranara convergence was all about connections—not just industry associations but family links discussed over coffee in the Judith Wright Centre foyer and outside on the Brunswick Street footpath. After the morning link-ups the fourth level meeting room beckoned, a reconfigured rehearsal space with tables and chairs set facing a small raised stage in cabaret style. Two lounges sat on the rostrum in anticipation of the many informal panels that became a key feature of the four-day event. Aunty Maroochy Barambah performed the welcome to country. With ochre on her face and wearing a possum skin cloak she glided through the room speaking in her Turrbul tongue. After officiating Aunty then voiced her concerns to the gathering that the Turrbul people were on the verge of extinction. This, she explained, was the perception of many settlers to the Brisbane area. Standing proud she commented on the resilience and indomitable spirit of her clan in the face of such opinion. Looking around the room Aunty then honoured the conference Elders, acknowledging the founders of modern Indigenous dance in Australia, like Carol Johnson who sat quietly at the back of the room, Michael Leslie the founding member of NAISDA Dance College, Francis Rings from Bangarra Dance Theatre and BlakDance founder Marilyn Miller. In the room was a Who’s Who of Indigenous dance in Australia. I identified many of the NSW dancers that I have worked with, watched and supported over the years in my previous role as Senior Aboriginal Cultural Development Officer at Arts NSW. These included Vicky Van Hout, Eric Avery, Jo Clancy and the Johnson sisters, Rayma and Kerry. There were also innumerable dancers in attendance whom I had heard about but never met, such as Gary Lang from the Northern Territory and Jacob Boehme from Melbourne. In addition were the invited international guests: dance performers Emily Johnson from Alaska, Jack Gray from New Zealand and Michelle Olson from Canada. All the dancers represented the resilience of an independent Indigenous dance sector which is largely misunderstood and underrepresented nationally and internationally. After introductions the international dancers and the Australian delegates— Collette Brennan from the Australia Council; Monica Stevens, Chair of BlakDance; Lydia Miller, Executive Director Aboriginal and Torres Strait Islander Board; and Karilyn Brown from Performing Lines—met to discuss the issues and challenges of touring work in their local contexts. Led by Collette, the forum focused on the possibility of identifying “stepping stones” for meaningful artistic and cultural exchange between Australia, New Zealand, Canada and America. Informed by the recent release of the Australia Council for the Arts International Arts Activity Report (August 2015) and the Building Audiences: Aboriginal and Torres Strait Islander Arts report (August 2015) the conversation began. Also in the room was Judy Harquail from Canada Presents and New York independent producer Meredith Boggia who both spoke at length about the limitations of presenting Indigenous work in their respective countries, especially in regard to presenter education and audience understanding of what constitutes Indigenous performance. Judy spoke to her work in Canada—the development of an open, independent producers network for touring Indigenous work. On how to educate presenters and audiences she noted that when it came to marketing indigenous dance the best methodology for articulating works to non-indigenous presenters was to ask the practitioners about their practice. She added that when describing a work, she recommended “a focus on the experience of a work and not the purpose.” The practitioners on the other hand mostly spoke to their individual practices, all voicing similar approaches. These included being led by a connection to place, having an authoritative process and establishing how to share work with different audiences. Dancer Emily Johnson spoke about her body-based dance/installation/theatre practice which is often influenced by her Yup’ik heritage. Her most recent work, Shore, is a multi-day performance installation in four parts examining the place of dance in the world and how dance can connect people in the present. Shore invokes ‘a sense of ground’ through listening, experiencing and eating, engaging with community through curated readings, a performance that moves from outdoors onto a stage and into a feast. Emily’s practice extends the notion of dance as individual practice to one that examines the idea of a collective body in shared time and place. She spoke about her practice as maintaining a sense of responsibility. When producing a work, her cultural and or artistic process was not always evident to an audience, even though she was in constant conversation about her indigeneity. Similarly Jack Grey, who hails from the Ngati Porou, Ngapuhi, Te Rwawa and Ngati Kahungunu tribes of Aotearoa, articulated his practice as embracing a sense of responsibility and guardianship. He spoke about his performance, Mitimiti, as a reflection on an embodied way of knowing that comes from a sense of place and of the authenticity and sense of responsibility with which to be present. Michelle Olson described her practice as drawing from a sense of responsibility inherent in the practice of embodying place and histories. Although there seemed to be some differences between how practitioners described and positioned their work and how presenters grappled with mediating those practices to audiences, there was some tangible ground for moving forward. All of the delegates at the regional, national and international focus meeting agreed on the need for more research on best practice for touring Indigenous work, to investigate an Indigenous-led model for touring and to build a body of writing around Indigenous dance and performance with a focus on developing a language around protocols for touring. Further, that a network of international opportunities for artists was a good place to start to get practitioners and their work noticed. Key to this discussion was developing international professional development opportunities such as residencies and presentations for Indigenous dance practitioners. The Dana Waranara four-day convergence presented many possibilities for the future of touring Indigenous dance locally, nationally and internationally. Building relationships between practitioners, presenters, producers and audiences is key to making these possibilities tangible. Developing opportunities for cultural and artistic exchange between participating countries facilitates knowledge of markets for First Peoples’ performing arts, as well as assisting in building platforms for local makers to experience international marketplaces and for practitioners, producers and presenters to share information, practice, protocols, resources and skills. This is a future worth working towards, but it is a prospect that will necessitate a commitment from all parties. Myself, I look forward to it. See also responses to Dana Waranara from Vicki Van Hout, Angharad Wynne-Jones, Liza-Mare Syron and Andrea James commissioned by BlakDance.